In 1991, when Henri d’Origny was asked to come up with a square watch, he designed the Nantucket watch for Hermès with an elongated rectangular case and an anchor chain motif. Now the watch has been redesigned in a new avatar called the Très Petit Modèle (17 x 32 mm) and is available in steel and 18k gold versions. 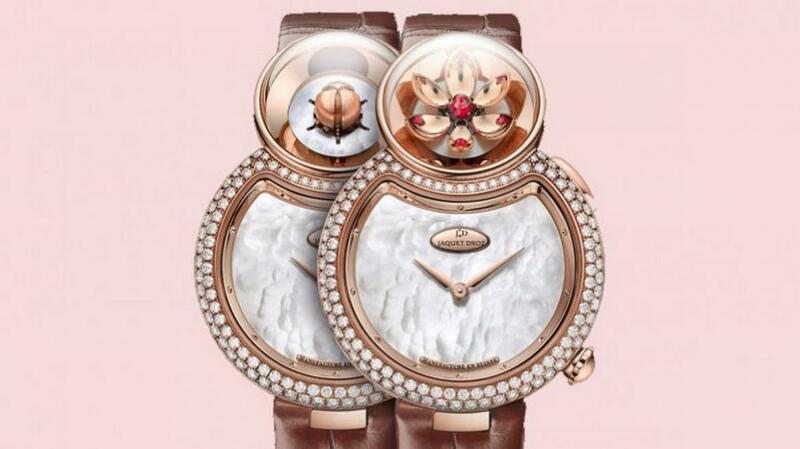 The gold watch is set with 186 diamonds and features a white mother-of-pearl dial. Thee steel version features an opaline dial. Powered by a Swiss Quartz movement, the watch provides the usual hour and minute functions and is water resistant to 30 m. The watch is available with either single or double wrap-around straps available in alligator or calfskin and in a broad range of colors. This is a lovely women’s day gift to your mom or best friend thanks to a truly timeless design and neat aesthetic. The watch is classically Hermès and will be a treasured timepiece for years to come. For the busy cosmopolitan woman who always has a tight-packed schedule, this Chanel Agenda is made especially for you. If you don’t have one, make sure to have this with you anywhere you go, as this beautiful Chanel organizer will definitely act as your saving grace! An elegant organizer from Chanel that is both beautiful and practical, the Agenda is sporting a black & burgundy lambskin that is every bit of sophistication. Its thick diamond quilting is so lavish that you can run your fingers through it every time you need to check your calendar. The small CC logo on the bottom right is on the other hand the icing to this beautiful cake! After being found to have infringed Tiffany & Co. (“Tiffany”) trademarks by selling counterfeit diamond engagement rings bearing the iconic jeweler’s brand name in September 2015, Costco is back in court, this time facing a jury trial to assess damages in connection with the Tiffany ruling. Despite the New York-based jewelry company’s push for damages, including a recovery of Costco's profits from the sale of the diamond rings and punitive damages, Costco told a federal jury in the U.S. District Court for the Southern District of New York this week that it owes Tiffany no more than $781,000 in connection with the sale of counterfeit versions of the jeweler's diamond engagement rings in its warehouse stores. Tiffany filed the original lawsuit in February 2013 in the Southern District of New York, a federal court in Manhattan, alleging that hundreds – if not thousands – of Costco members bought engagement rings under the false impression that they were authentic Tiffany products. In her ruling last year, U.S. District Judge Laura Taylor Swain ruled against Costco and shot down claims that Tiffany's trademarks were invalid because they sought to prevent others from using "Tiffany" as a generic description of a type of ring setting. Swain ultimately held that Costco, the largest U.S. warehouse chain, had, in fact, infringed Tiffany's trademarks by selling engagement rings that caused confusion among consumers due to Costco’s use of the word “Tiffany” in display case signs. Swain found that Tiffany had met its burden in proving willfulness (where the plaintiff can show that the infringement is willful, a court may award enhanced damages, attorney fees, and prejudgment interest) by showing that Costco's jewelry buyers asked vendors to copy Tiffany designs, and that Costco employees were aware of customer confusion but did nothing to remedy it. She further held that Tiffany should get Costco's profits from the sale of the counterfeit rings, and that it could seek punitive damages (due to its satisfaction of the willfulness requirement), under New York state law. At the outset of the damages trial this week, in which a jury will determine Costco's monetary liability for selling rings under the "Tiffany" name, Costco attorney James Dabney of Hughes Hubbard & Reed told the court that Costco has determined that it sold about 2,500 units of the infringing rings. Moreover, he asserted the retailer's infringement relates to a problem managing certain display case signs, which has since been corrected. To this, Tiffany's attorney Jeffrey Mitchell of Browne George Ross argued that the jeweler believes that Costco's records are erroneous, and that the number of rings sold could be as high as 11,000. He said Costco's gross profit for the rings falls somewhere between $1.8 million and $6.3 million. He also asked jurors to consider why Costco uses its in-house label on most generic products, but not jewelry. "Costco wouldn't dare call its own painkillers Tylenol or Advil. Why would Tiffany be any different? It shows callous disregard for Tiffany's trademark rights." UPDATE (9/29/16): The jury has awarded Tiffany $5.5 million in damages. It put Costco's profits from the infringing sales at $3.7 million but held that figure was inadequate to account for the benefits the defendant derived from the sales, adding $1.8 million on top to come up with the $5.5 million figure. Still to be determined: punitives. So what do we do when we can’t find the bag we are hunting for? We check Chanel earrings and there are so many choices. Oh gosh, Chanel Cearrings. Let’s dive into the details, shall we? So here are our two favorite picks. These Chanel CC Leather Woven Chain Earrings are made from the House’s most iconic elements. Just look at it! Gorgeous earrings, with CC signature in the center and surrounded with Leather Woven Chain, just like your Classic Flap Bag. So here’s the conclusion, without the Classic Wallet and these Classic Earrings, your Classic Flap Bag will never be complete. It’s a pair of unique earrings, but you either love it or not. Here is a pair of Chanel Bug Earrings crafted from metal, strass and resin. While it’s beautiful and shiny, these earrings are made with the utmost attention to the details. Take a closer look at the wings and the body of the bug; it’s embellished with little shiny gems. So which one are you going to hunt this time huh? Without further ado, here’s Part 2 to Chanel’s 6 Things You Didn’t Know About The J12. And that’s it folks, 6 things you never knew about Chanel’s J12, and if you missed the first part, have a look here via this link. If any of you have more questions regarding the J12 or any of Chanel’s other timepieces for that matter, drop a comment here and I’ll get back to you guys as soon as I can. 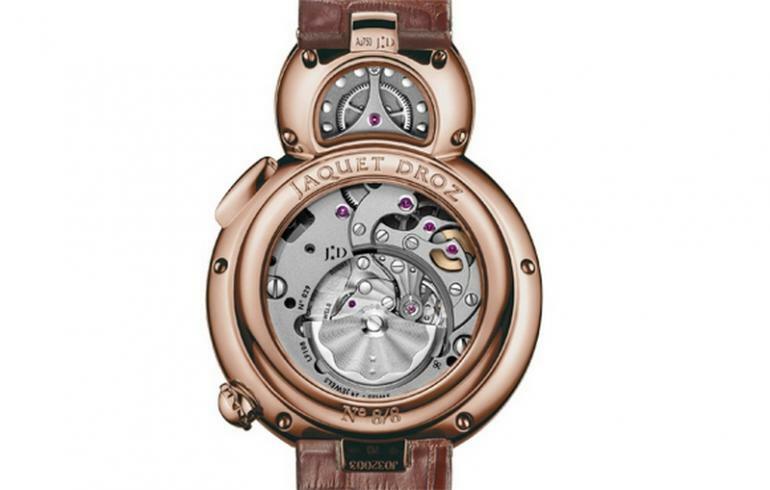 Who needs flowers when you have Jaquet Droz’s blooming Lady 8 Flower watch? Back in 2013, celebrated watchmakers Jaquet Droz created their first ever women’s watch: the feminine and intriguing “Lady 8”, this year the brand is revisiting this classic style and adding a few upgrades. 2016’s Lady 8 Flower features the same figure 8 shape but this time the top dial has been adorned with a flower that literally blooms for the wearer. The flower automaton takes the form of a lotus, a flower that symbolises peace in some Asian cultures. Under its sapphire crystal dome, the six petal flower opens up when you press the push-button at 2 o’clock. Gold petals surround a briolette-cut sapphire or ruby which marks the center of the flower. 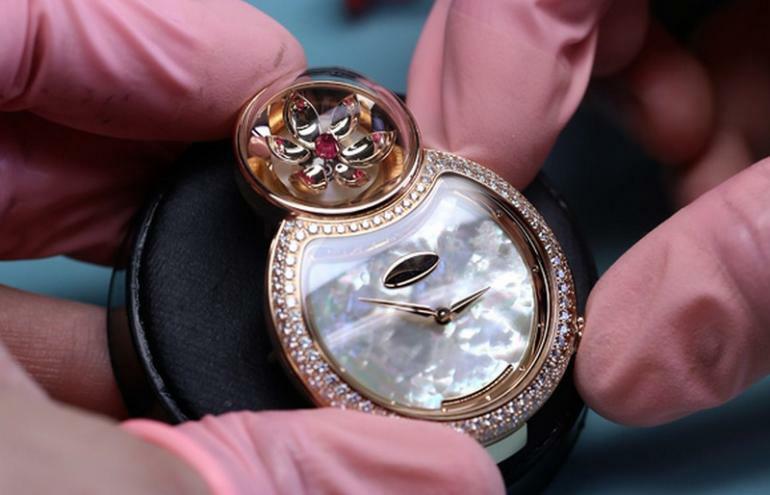 Meanwhile the actual watch dial is made from white mother-of-pearl. The white gold version has an intricate guilloché sun-ray pattern that we adore. 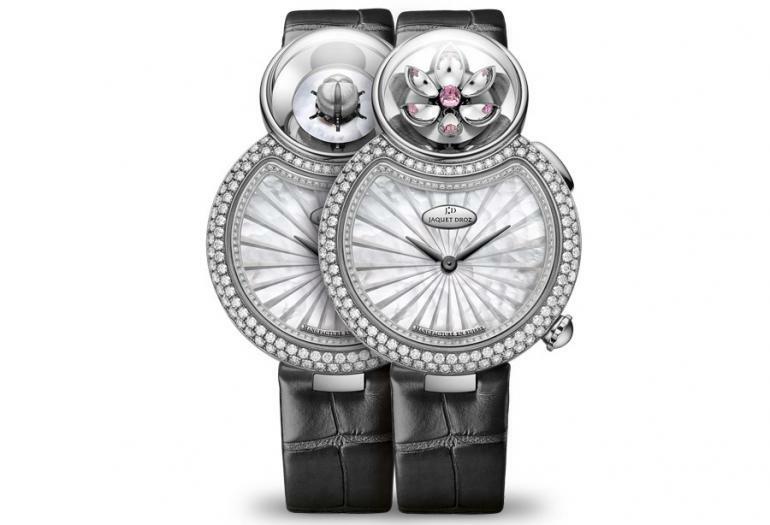 The watch is powered by two movements, one for the flower automaton and one for the actual watch. Both movements are visible through the transparent caseback. The self-winding Caliber 29 watch movement offers a 38 hour power reserve. Also visible through the back is a pirouetting oscillating weight inspired by an accordion pleat motif. The watch is available in white and rose gold variants and is limited to just 8 units of each. Both versions have cases encrusted with 114 diamonds, but the white gold is our favorite thanks to the charming sunray design on the main dial. An alligator strap in black (for the white gold watch) or brown (for the rose gold watch) complete the timepiece.